Key to creating an ethically-compliant practice? Setting up a proper conflict checking system. It’s not hard and creating a solid system on the front end saves you time and effort. And possibly an ethics investigation. I help lots of folks transition from an existing practice into a new one. My clients often are coming from a firm that handles this task for them, and thus are fairly clueless on how to set up a robust system. So, the conflict system is always at the top of our to-do list. You can explore some general, helpful ideas on this topic here. The system I recommend for my clients using Clio: when opening a new matter, create a Note within the matter titled [Case name] Conflict Check. Then add to the note all of the names (related parties) and any other information relevant to a conflict check. This saves all of the names (and other relevant information), so when I run a check in the future, any matter note containing the search name or term pops up. At my finger tips, I have not only the name(s), but all other pertinent information I need to conduct a thorough check. Build this into your matter intake system and you’ll create a robust conflict checking system that makes this crucial task easy and efficient. And if you’re not using Clio, think about the systems you are using and how you can integrate the conflict check in seamlessly. Other cloud-based practice management platforms (like MyCase and RocketMatter) have similar tools. You can also use Google Apps (contacts) in much the same way. 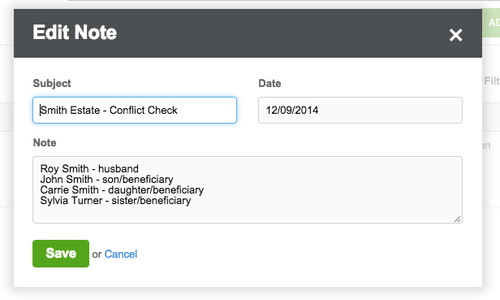 Insightly, a CRM I use for project (and client) management, also includes multiple ways to create a database for conflict checking (through both contacts and notes within matters, all of which are searchable). So if you’re not using your tech tools in this way yet, go do it. NOW. do you have a social media security policy? 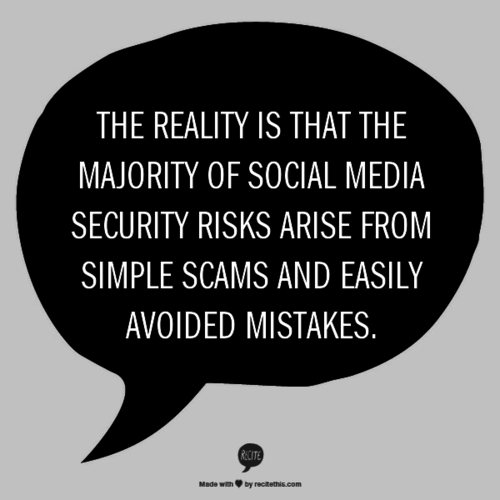 So do you have a policy to manage the security of your social media efforts? Go here, and do these things. And share with your clients, too. I’ll be talking cloud at the last workshop of the year. Only a couple of spots left on one date: Thursday, December 4, 2014 from 1:30 — 3:30. At my quite comfy office in the Factory at Franklin. Tennessee attorneys get two hours of dual CLE (bonus!). More info and to register — go here. InspiredLawBlog is written by Caitlin [Cat] Moon, a sometimes attorney who is always helping others work smarter, happier, and techier. This really deserves an entire post (which may happen). But the gist is this. You don’t do something just because you can do it or it’s cheapest to hire yourself to do it or even easy for you to do it. 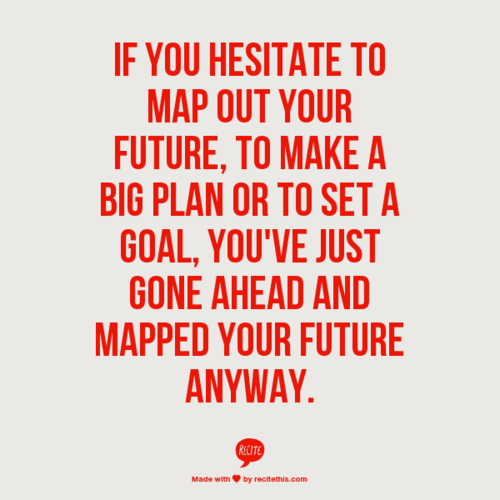 By it, I mean build your website, manage your back office accounting, draft documents that are essentially templates (and a lot of other things). You do the work under the following circumstances. You need to be Mario Batali. Because people (clients) will notice when you do it. That might mean that they notice your presence, or they notice the unique nature of what you create (your art) or they will notice that you’ve learned something doing this when it leads to you doing something great later on. Mario Batali doesn’t cook for 99% of his customers (physically impossible), and they can’t tell. And he doesn’t design 99% (or 5%, I have no idea) of his recipes, because we can’t tell. In fact, the only thing people can tell is that it’s him on the TV, and that his decisions are guiding what his organization does next. And here’s a list of some things that you can start outsourcing today. And here’s another thing. Scheduling with lawyers is often a nightmare. Get some help. I learned about “lollipop moments” from this lawyer’s blog. I love this idea. Every lawyer should have this quote framed and on the wall. Where it can be seen at all times. The EMAIL CHARTER. I’ve done 1, and now 2. You? Back to the opening theme of this week’s links. Want to grow your practice? Be happy? Then you must learn how to delegate. Try the 70% rule on for size. I continue to be baffled by the fact that so many lawyers are baffled by this truth. A law practice is a business. 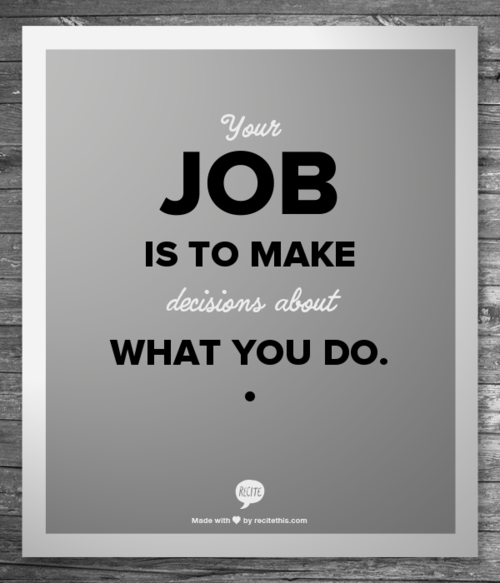 Until (and unless) you learn how to delegate and make really good decisions about the work you do (and the work you don’t do), then you’re going to spend more time running your business than practicing law. A good wrap up on today’s theme, I do believe. Go here to read Eriz Mazzone’s six steps to using Evernote at your next meeting/conference. Inspired Law Blog is written by Caitlin (Cat) Moon, a consultant and coach to lawyers and other driven people who want to design inspired ways to work.